BusinessWeek, April 13, 2010, notes that NetApp has shipped more than 5,000 units of V-Series, showing a 70% year-over-year growth in the adoption of the product line. Why has this singular product been recognized by so many organizations as key to greening their data center? As a heterogeneous storage solution, the V-Series offers customers a method to place a variety of storage arrays in SAN environments under one umbrella system. Whether you are running IBM, HP, HDS, EMC or others, you can leverage the benefits of data deduplication, simplified virtualization infrastructure management, and more efficiently leverage your storage investments. This leads to a savings in storage, power and space which means a lower TCO, higher ROI and a happy CIO. 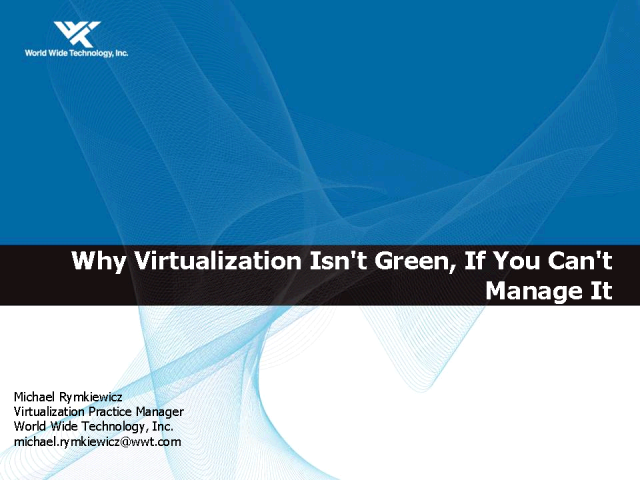 A discussion on various green initiatives virtualization brings to the organization will also be discussed. Join industry leading solutions integrator, World Wide Technology, to learn more about why you should consider the V-Series, and other similar products, to enhance your data management and virtualization capabilities.